Get up and eat, else the journey will be too long for you. . . . He who eats this bread will live for ever. Last Fall, the Museum of Fine Arts in Boston was having a special exhibit of Masterpieces of Catholic Art from the country of Spain. A classmate of mine from the Diocese of Bridgeport CT, Fr. Greg Markey, whose the Pastor of a mixed parish of Irish and Hispanics, also wanted to see it, and so we made plans to get together on our day off one Wednesday and head up there. My friend was asking me if I’d like to take a month off in the summer to walk it with him. So that’s what I did last month, and Fr. Markey, who last year went to Maine with me, flew over to Europe, and on June 23rd he set out alone and on foot at the French border with his 28 pound backpack, wearing a short sleeved clergy shirt and hiking shorts, with a little American Flag over one shoulder and a Vatican Flag over the other one, hoping to make it to Santiago for July 25 the Feast of St. James. He kept a diary of his travels, and thanks to the wonders of technology, every seven days Fr. Markey would email a letter back home to his the parish via his Blackberry, which was then put on the parish website of St. Mary’s in Norwalk CT.
After 12 days of walking, my friend had 12 blisters on his feet, had twisted his ankle, and started to say to himself “What did I get myself into?” He almost despaired at this point of achieving his goal, but managed to persevere by God’s grace. As the days went on, Fr. Markey met various people along the Camino or walking the Camino with him. He encountered among other people, many non-practicing Catholics who he gave Miraculous Medals to, an anti-American, anti-Catholic college professor walking with a group of his students, and a zealous young Muslim man from Morocco who got more than a little temperamental when my priest friend refused to convert to Islam. 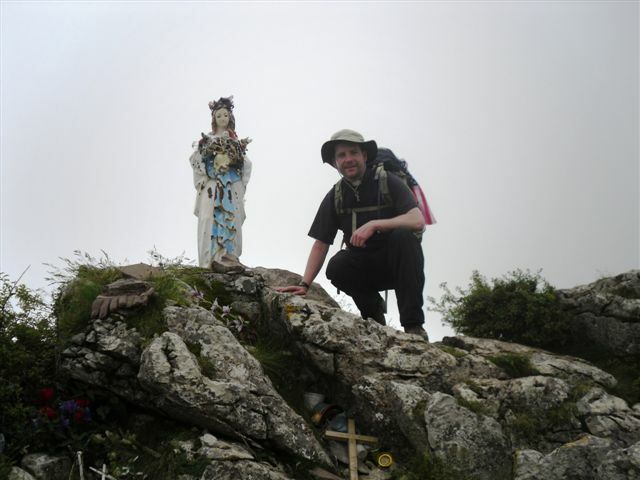 He also met many devout Catholics from all over the world going the Camino as a pilgrimage like he was, including a group of college students from the US whom he journeyed many days with. Finally, Fr. Markey was spiritually encouraged to continue on in his pilgrimage by the beautiful, centuries old Gothic Churches and Cathedrals that line this 1000 year old pilgrimage route. Well, on July 24th, 33 days from when he started, and after 568 miles of walking through the Pyrennes mountains of France, through the Dry and Hot Castillian Plains of North Central Spain, and through days of pouring rain in the green Gallatian Mountains of North West Spain, Fr. Markey entered through the gates of the city of Santiago, and the next day he celebrated the Feast of St. James with the Bishop and thousands of Pilgrims, most of whom had flown or drove to get there. In the first reading today, we see Elijah talking a very similar pilgrimage, walking 40 days and 40 nights from Mt. Carmel to Mt. Horeb. It wasn’t that Elijah was an Olympic Athlete to want to do this, nor did Elijah take steriods or other performance enhancing substances to accomplish such a grueling journey. Rather, Elijah was able to take that pilgrimage by eating the Bread God miraculously gave him through the Angel – Bread which was a symbol of the Bread Jesus speaks of in today’s Gospel. Walking pilgrimages are very much a part of our Catholic heritage and culture, something we need to get back to in our world today. A walking pilgrimage to a holy shrine, whether it’s just a day long one of a few miles, or a month long of hundreds of miles, is supposed to be symbolic of our life long pilgrim journey following Jesus on the road to Heaven. Both are journeys we choose to make. My friend Fr. Markey had to choose to get on a plane, fly to Europe, and set out on the Camino. And all who follow Christ must choose to get off the wide road that leads to destruction, pick up their Cross daily, and set out on the narrow road that leads to eternal life. Both are journeys which test us in both body and spirit, to the point where we may be tempted to want to quit. Fr. Markey had his twisted ankle and 12 blisters, and at times on the pilgrimage of life, keeping the commandments or persevering in the Faith can become very challenging when the road gets steep or long for us. And finally, both types of pilgrimages are filled with many graces along the way. Fr. Markey had brother pilgrims, beautiful gothic Cathedrals and a fountain full of wine to inspire him to keep going, and in the same manner, Jesus will give us fellow Christians who will inspire us to continue on, He will give us spiritual consolations when we need it most. And like Elijah, it was the supernatural strength of the Bread come down from Heaven more than any bodily strength that enabled my friend Fr. Markey to persevere those 33 days of walking, and finally reach the end of his journey. And it is the Holy Eucharist which will give us the strength to persevere in following Jesus throughout our life, and which will, please God, nourish us until we reach the end of our earthly pilgrimage. God told Elijah Get up and eat, else the journey will be too long for you. As you and I make our pilgrimage through life, trying to stay on the narrow road that leads to heaven, may we frequently and devoutly, every Sunday at least, get up and eat the Bread of Life, that the Journey may not be too long, but a Journey full of blessings which ends at the Gates of Heaven after a life lived walking with Jesus. Fifty years ago, when the Church was celebrating the 100th Anniversary of the Death of St. John Vianney, Blessed Pope John XXIII wrote an Encyclical devoted entirely to the Cure of Ars called Sacerdotii Nostri Primordia (“From the Start of our Priesthood”). There’s a passage in that Encyclical where John XXIII marvels at how, at the end of his life, St. John Vianney could convert souls even without saying any words. People couldn’t understand St. John Vianney’s words at the end of his life, but it didn’t matter, because they could understand his Love, and that was all that was really needed to convert the hardest of hearts. St. John Marie Vianney’s life and ministry won’t make any sense unless we view it from the vantage point of Divine Love. His preaching, his extreme penances, his intense labours and prayer life were that of a man on fire with the Love of Jesus. And based on his own testimony, the Zeal and Love that John Vianney showed was a response to the great gift of the Priesthood which God had bestowed on him. It was John Vianney’s awareness of the greatness of this Sacrament of Priesthood given to him, and his response to this great gift and mystery of the Priesthood, that really enabled him to become the Saint we venerate today. In this talk tonight I’d like to reflect on the life and ministry of John Vianney, seeing it as an outpouring of the Love of the Heart of Jesus. St. John Marie Vianney was born May 8, 1786 into a devout Catholic family living on a farm in the countryside several miles outside of Lyons France. The end of the 18th Century was a difficult time in France to practice the Faith; by the time Vianney was 7 years old, the Revolution had set up a state run Church and priests faithful to the Pope risked death by the guillotine. While some loyal priests fled the country, many went underground, staying in France and keeping one step ahead of the law. One priest who lived in a nearby village disguised himself as a carpenter and another as a cook. These two priests and others would frequently come in the dark of night to say Mass at Vianney’s house under peril of their lives. Year’s later, the Carpenter priest, Fr. Balley, would be the Pastor at Fr. Vianney’s first priestly assignment. Certainly as a child, John Vianney was influenced by the love and respect that his parents had for priests in risking imprisonment for harboring them, and the love these heroic priests themselves showed in risking their lives to bring Jesus to the faithful remnant in France. It was probably then that he said “I want to have the love for Jesus that these men have” and felt the call to the priesthood. And so from a very young age, John Vianney began to nourish that love for Jesus with a steady diet of prayer, penance, and reading the lives of the Saints (which he did every night before he went to bed throughout his life). St. Paul says “The Love of Christ urges us on” and this Love of Christ made Vianney persevere and not despair in achieving his desire to become a priest despite many obstacles that stood in his way. It was if the devil realized back then that if this guy became a priest it would be bad news. First he had to win over his father to the idea, which took two years. Then when he did enter seminary, he struggled greatly with his studies. It wasn’t that he was unintelligent, it was more that he had a bad memory. “I could not lodge a thing in my bad head” he once said. At one point, he decided to call it quits, but Fr. Balley his spiritual director encouraged him to take a pilgrimage to the shrine of Jesuit St. John Francis Regis, which ended up being a turning point in his life. The next great trial on the road to priesthood was in his third year of minor seminary, when the 23 year old Vianney was drafted into Napoleon’s Army by a bureaucratic mixup. His name should have been on the list of exempt seminarians, but it wasn’t, and the army wouldn’t make any exceptions. Almost immediately after going to the barracks, he took very sick and was sent to the hospital. Several months later he left the hospital and his troop had left without him. As he set out on foot in the middle of winter to catch up, he again took sick and entered a village to recover. Once he recovered, there was no way to catch up, and Vianney was considered a deserter in the army, which was a common thing in those days. The sympathetic mayor of the village sheltered him, and for several months he lived in the village as a school teacher under the alias Jerome Vincent. Finally, an imperial decree granted amnesty to all deserters, and Vianney was able to resume Seminary training. The final trial on the road to priesthood came when after a year of major seminary he was kicked out for poor grades due to not being able to understand the Latin that the classes were taught in. His mentor Fr. Balley got permission from the Bishop to privately teach him, but even then he failed the final exam the first time and barely passed it the second. Deciding that his great holiness outweighed any intellectual deficiencies, the Bishop of Lyons ordained 29 year old John Vianney a diocesan priest on August 13, 1815. But due to the low score on his final exam, the Bishop didn’t think Fr. Vianney would be competent enough to hear confessions, so he forbid him the faculties to do this, and it was a few months into his priesthood before Fr. Balley was able to again come to the rescue and twist the Bishops arm to allow him to hear confessions, ironic as that is! John Vianney spent the first two years of his priesthood working under Fr. Balley, who was a mentor and father-figure to him. But then Fr. Balley died, and the priestly honeymoon was over. It seems as if Vianney’s new pastor didn’t get along with him, and asked the Bishop to transfer Fr. Vianney to another parish. And so the Vicar General assigned Vianney to be the administrator of a run down Church that had seen better days, in a tiny little village of 230 souls called Ars, in a far flung part of the diocese that most priests of the day considered to be Siberia, a place where the Bishop sends the least promising priests he doesn’t know what else to do with. Fr. Vianney arrived at Ars in the middle of the Winter, and found the people’s love for God even colder than the weather was. Very few attended Sunday Mass, and there was widespread ignorance about the Catholic Faith. Sunday was just another work day, while Sunday night was drinking and dancing night; the partying began in the afternoon and went on until late in the evening. It must have been a great temptation that first year for John Vianney to want to shake the dust off his feet and ask for a new assignment. But the burning love of Jesus kept his heart warm those first few years, and inspired him to take 5 Pastoral Initiatives that turned his whole parish around. First, in the early years, John Vianney would walk all around his parish and visit with his parishioners both at home and as they were working in the fields. He got to know each of them personally, and this made his preaching and ministering to them most effective. Secondly, St. John Vianney set out right away to renovate his Church, using only his own money. He would only buy the most beautiful and most expensive vestments and chalices. His rectory was poor and unfurnished, his cassock was thread bare, but he spared no expense when it came to the Liturgy. The Third Pastoral Initiative was to foster devotion to Mary and the Saints. Early on, he bought a beautiful large Gold Statue of The Immaculate Heart of Mary and placed it at the entrance of the Church. Inside her heart he placed all the names of all the parishioners, and consecrated the parish to Mary’s Immaculate Heart. The fourth and fifth pastoral initiative dealt with St. John Vianney’s priestly care and concern for children. To combat the illiteracy of the children and to provide shelter for orphans, he started a free school for girls called “The Providence” which for 20 years he financially supported and visited on a daily basis. On at least two occasions, God miraculously multiplied grain and bread dough to feed the children according to eyewitness testimony at the canonization process. His priestly care for children also showed itself in the Catechism Lessons he gave the children of Ars every day in the Church at 11 a.m. for all 41 years of his time there. Supposedly adults would get just as much out of these talks as the children did! Within 2 ½ years, John Vianney wrote to his sister that he had transformed his parish. Mass attendance was close to 100%, children and their parents knew their prayers and their catechism, the poor were being ministered to. The five taverns in his town went out of business because no one was going to them anymore. Instead of dancing and drinking on Sunday evenings, young and old alike went to a Sunday Vespers prayer service. While the pastoral initiatives just mentioned were a big part of this transformation, John Vianney attributed his success more to the prayers and penances that the love of the heart of Jesus inspired him to perform. 2) it drove him to spend long hours on end imprisoned in the confessional, for most of his years as a priest. His penances are definitely of the “don’t try this at home” type. Each Monday he would boil up a pot of seven potatoes, one for each day of the week. That was about the extent of his diet for the first 9 years at Ars. By the end of the week, they would be mouldy, but he would eat them anyway. Each evening Vianney would use a device called the discipline, a kind of whip used to whip oneself on the back. He tied sharp bones to the end of his so that it would make his skin bleed. The blood can still be seen on his curtains in the Rectory. But even in his later years when he began under order of the Bishop to put away the discipline, to eat a little more and to sleep on a bed instead of on the floor with a log as a pillow, he still went to bed (not necessarily to sleep) at 11 p.m. each night, and rose three hours later at 1 a.m. to start hearing the lines of confessions waiting at that wee hour of the morning. About ten years into his assignment, pilgrims began to journey to Ars to go to confession to John Vianney. For the last 30 years of his life, he was unable to get a day off. By 1845, 300 pilgrims a day were arriving in Ars. A round trip train ticket from Lyons was good for 8 days, as that was how long it took from the time you took a number to the time you got into the confessional. And so in the cold of winter and in the scorching heat of summer, John Vianney spent 16 to 18 hours a day in the unheated, non-air conditioned confessional box. Again, only from the vantage point of the love of the heart of Jesus can we make sense of why and how John Vianney would endure such penances and long hours in the confessional. The Love of Christ urged him on, it kept him from giving into the temptation to flee Parish life and enter a monastery. And finally, the love of the heart of Jesus was what gave St. John Vianney the strength to endure 21 years of demonic infestation. About 3 years into his parish assignment at Ars, just after he had succeeded in converting the whole parish, the Devil (who John Vianney nicknamed the Grappin) began to harass him on an almost nightly basis. In the stillness of a frosty winter night in 1824, terrific blows were struck against the presbytery door and wild shouting could be heard coming, so it seemed, from the little yard in front of the house. For a moment the Cure suspected the presence of burglars so that he asked the village wheelwright, one Andre Verchere, to spend the following night at the Rectory. It proved an exciting night . . . . Shortly after midnight there suddenly came a fearful rattling and battering of the front door whilst within the house a noise was heard as if several heavy carts were being driven through the rooms. Andre seized his gun, looked out of the window but saw nothing except the pale light of the moon: “For a whole quarter of an hour the house shook—and so did my legs,” the would-be defender subsequently confessed. The following evening he received another invitation to spend the night at the Rectory but Andre had had enough. Ultimately, the Devil gave up trying to demoralize Father Vianney, realizing it was a hopeless cause, and for the last 14 years of his life John Vianney was able to get a peaceful three hours of sleep each night, all the rest he needed to hear 16 hours of confessions and do all his other priestly duties, a schedule he kept up until a week before he died. Towards the end of his life, people were coming from all over the world to go to confession to this humble priest, who refused any honors given to him and who’s one desire in life was to retire to a monastery to prepare his soul for eternal life. On August 4th , 1859, John Vianney died during a violent thunderstorm at age 73, having for 41 years witnessed to the Love of the Heart of Jesus in service to the parishioners and pilgrims of his little parish of Ars. May this celebration of the 150th Anniversary of his death, and this entire Year of the Priesthood, renew all priests in their ministry, that they may show the Love of the Sacred Heart of Jesus, to all they minister to, as St. John Vianney did so well in his life. In the First Reading, we read the account of how God provided for His People as they journeyed through the desert to the Promised Land. The Israelites had no sooner miraculously escaped death on the shores of the Red Sea, when they are suddenly confronted with another major crisis: they have no food, and they are in the middle of a barren desert. But just as the Lord God delivered them from cruel slavery in Egypt, and just as He delivered them from Pharaoh’s armies at the Red Sea, so did God have a plan to deliver them from hunger in the desert. For all Forty Years of their journey, God gave the Israelites a miraculous Bread to satisfy their hunger and give them the strength the journey on. As the first reading says: In the morning a dew lay all about the camp, and when the dew evaporated, there on the surface of the desert were fine flakes like hoarfrost on the ground. The Bible says that the Manna first appeared on a Sunday morning, and the Israelites first ate it on that day. Every day of their journey, every able bodied Israelite was required to go out in the morning and collect only enough Manna for that day’s meals. Whatever Manna was left on the ground would melt and disappear when the heat of the noon day sun hit it. The Manna left on the ground miraculously melted, but the Manna that was collected didn’t melt even when it was baked into bread in a hot oven, which was how the Israelites normally prepared it. If the Israelites tried to collect extra Manna and stockpile it for future use, the next morning the Manna they stored would be miraculously rotten and worthless, because the LORD God strictly ordered the Israelites only to take enough for that day. But while the Israelites were strictly forbidden to gather extra manna, their were two exceptions to this rule. First, God did allow them to collect more than a day’s worth every Friday. On Fridays they were to collect two day’s worth, because on Saturdays, the manna would not appear as it was the day God commanded the Israelites to rest and do no work. On Saturday, the sabbath day, the day old Manna would not be rotten but was able to be eaten until the Manna reappeared every Sunday. And the other exception was that God ordered Moses to take an omerful of Manna (which is about 8 cups worth) and place it in a golden urn for future generations to see it. According to the Book of Exodus, Manna looked like tiny little white seeds about a half a centimeter in diameter. In other words, the Manna miraculously tasted like whatever flavor you wanted it to taste like. If the Israelite eating the Manna wanted it to taste like chocolate, it tasted like chocolate. If they wanted it to taste like Lobster, it tasted like Lobster. Like Dynamites, it tasted like Dynamites! Such miraculous food did the People of God eat every day for Forty Years as they journeyed to the Promised Land. And three days after they finally entered the Promised Land it was the feast of Passover, and Book of Joshua says On the. . . .day after the Passover on which they ate of the produce of the land, the manna ceased. No longer was there manna for the Israelites, who that year ate of the bounty of the Promised Land. Such was the Miraculous Manna which the People of the Old Covenant were Fed as they journeyed through the wilderness. But in today’s Gospel, Jesus tells us that the Old Manna given was just seeds compared to Him. Like the Israelites of old, Jesus miraculously appears each day on our altars to be the Spiritual Food that will keep us from Spiritual Starvation in this dry and barren world as we journey to the Promised Land of Heaven. Maybe we can’t get to communion each day, but we still need to each day make a spiritual communion, asking Jesus to come to us in our prayer time, being fed by His Holy Word, the Bible. Like the Manna of old, we can’t stockpile holiness, we need to pick up our Cross each day and follow Jesus. And on the Lord’s Day, now Sunday, we rest before the Lord as He does the work for us and comes to us in Holy Communion. And just as Moses reserved the Manna of Old in a Golden Urn, so the Church Reserves the Blessed Sacrament in a golden Tabernacle for the veneration of the faithful. And the Eucharist, like the Manna of old, “serves the desire of him who received it, and (is) blended to whatever flavor each one wishes” Whatever “flavor” of grace we are in need of – some virtue, a healing, graces for a loved one – Jesus will supply that when we eat of the New Manna, the Bread of Life. And finally, when we reach Heaven, the promised land, at the end of our journey through the wilderness of this life, we will no longer eat the Bread of Life, we will instead see Jesus face to face. So may we say to Jesus what the people in today’s Gospel said to him: Sir, give us this bread always! May Jesus always give us this bread, and may we who eat of it live forever with him one day in Heaven. You are currently browsing the fatherwoolley.com blog archives for August, 2009.